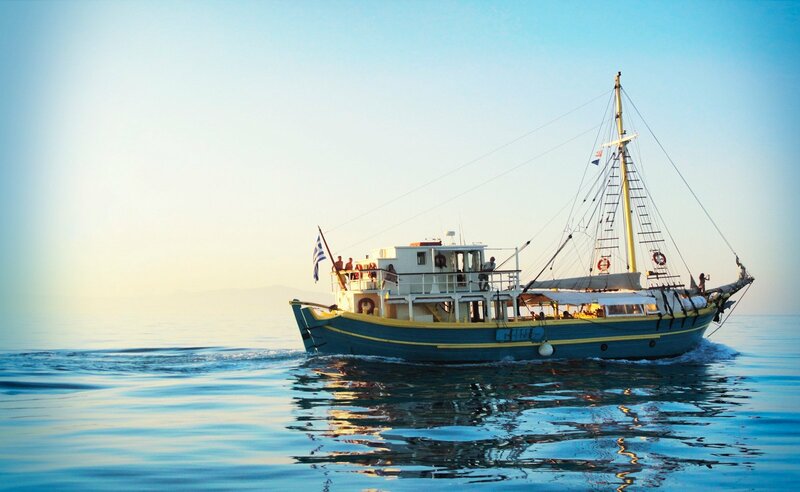 Mykonos ways to explore the sea! Water Sports Mykonos! 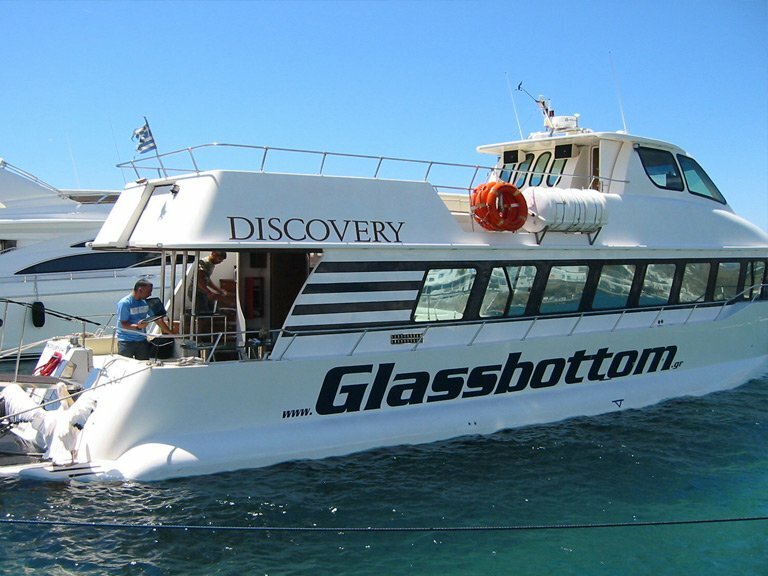 Glassbottom (www.glassbottom.gr) is a truly unique vessel: the wide bottom part of its hull is made out of glass, allowing its passengers a glimpse into the beauty hiding beneath the sea's surface. 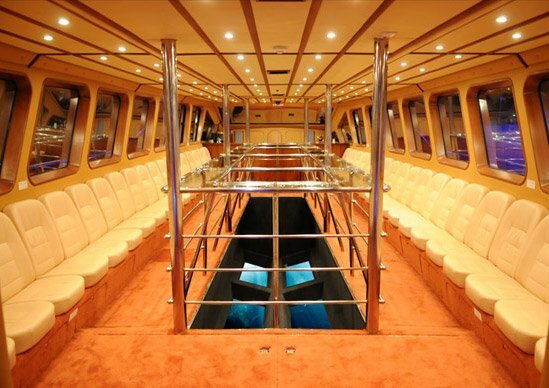 The daily cruises on offer by the Glassbottom combine visits to popular beaches, sightseeing and many activities tailored to the wishes of the people on board. 1) Treasured beaches, including the truly magnificent Tragonisi beach, which is unreachable by any other means. This trip also includes a stop-over at Agrari beach for some watersport action, as well as a BBQ lunch on board. 2) Sunset, giving the passengers the chance to enjoy the sun sinking into the Aegean, while drinking their cocktail on board and taking in beautiful vistas of Chora's main attractions, such as Little Venice and the Windmills. After the night falls, the cruiseship turns into a club, partying into the early morning hours. 3) Delos, for those interested in the unique archeological sites and findings around the area, including guided visits on the island of Delos and its museum, and the neighbouring Rhenia islet. 4) Exclusive destination, leaving to you the choice of itinerary, food, drink and music. Located at Lia beach, Go Dive Mykonos (www.godivemykonos.com) is a resort exclusively dedicated to diving, certified by the Professional Association of Diving Instructors (PADI) for the quality of its provided services. Their experienced instructors speak a variety of languages and are readily available to guide and accompany anyone interested in discovering the underwater world in safety. Following the highest quality standards, Go Dive Mykonos organizes daily trips to scenic dive sites, such as the Anna II shipwreck, the reefs of Kalo Livadi, Agia Anna and Lia bay and the cave system of Tragonisi. 2) Excursions: in collaboration with the Marine Conservation of Greece to discover Mykonos' rich underwater life. 3) Boat trips: offering the chance to book a private tour to secluded anchorages, have a picnic lunch in scenic spots and be catered for your every need by a team of discreet and professional staff. Ideal for honeymooners! 4) Snorkel: combine the beauty of under-the-water views with the fun of free swimming, without the burden of the diving equipment. 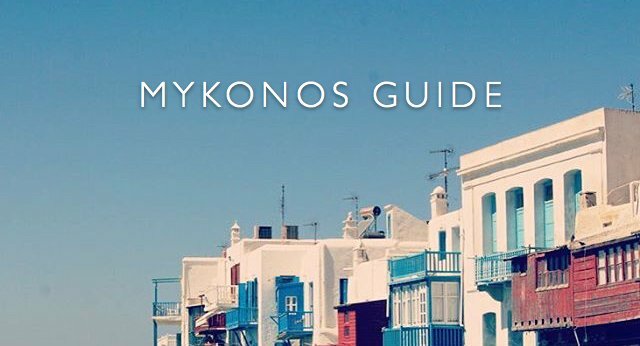 Book our hotels in Mykonos! Click now! 1) Jetski: specially trained instructors will teach you how to operate the vehicle and inform you about the necessary safety procedures and then, the stage – or. rather, the surface – is all yours! 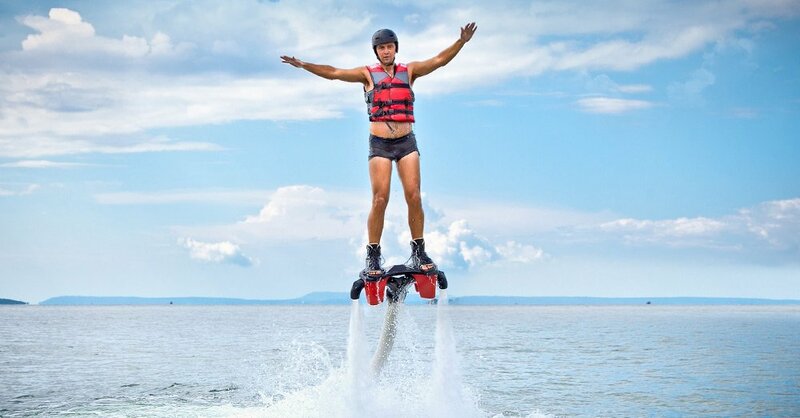 2) Flyboard: the latest craze of the seas, this magnificent gizmo opens the senses into a whole new world, allowing you to defy gravity, moving from underwater to above the water. 3) Tubes: categorized as an 'extreme' sport, because of the speed and technique one must master to stay on the rings, it is the most fun challenge you'll ever have amongst friends. 4) Sofa: share the fun with your family and friends, in a more relaxed, safe but equally enjoyable way suitable for all. 5) Parasailing: harness the sea and air at the same time, for a real flight experience hanging high above the deep blue, after a short training session. It's the best panoramic view you can get! It was an old merchant ship, a traditional Aegean Sea hull built in 1948, which had gone through many hardships and rough seas. Fifty years after its maiden voyage, Phoebus (www.phoebus.gr) went back out into the sea again. It had taken artist and decorator Zannis Koukas 6 whole years to restore it, maintaining its original beauty and charm and highlighting its unique identity. 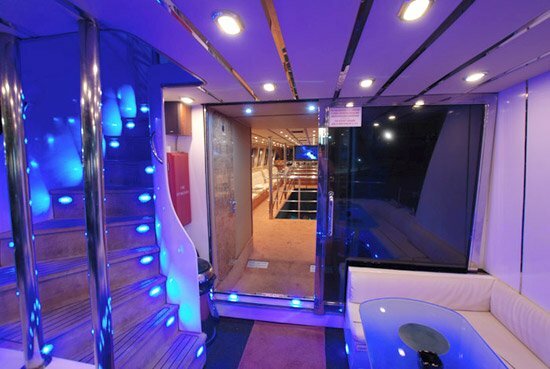 The 21,6m long, 15m high beamed, open deck contemporary Phoebus is a luxury cruise ship fully equipped with two open bars, a dining and a lounging deck, catering for any special circumstance. This traditional wooden caique-turned-motorsail can take you to small ports, deserted beaches, nearby islands (Delos, Tinos, Paros, Rhenia) and is ideal for beach-hopping or wed-partying in style. For those looking for a more active -albeit educational- way to spend their holidays, Kayak Day Tours (www.mykonoskayak.com) offer a variety of daily excursions, keeping you fit and aware of Mykonos' fabulous scenery. Visit tucked away sights and turqoise coasts and learn more about the island's flora and fauna, while getting off the beaten track. No previous kayaking experience is required, since the routes are designed to cater for all levels of experience and ability. Just bring your swimsuit, T-shirt, shorts, towel, paddle shoes and plenty of sunblock and get ready to be introduced to a fun and environmentaly friendly sport, always in a safe manner. A different trip in on offer each day, for groups of up to 16 people, led by experienced local guides. A healthy snac, a delicious picnic lunch and free photos from the day's activities are included in the price!